This tutorial is going to cover about how to install Docker on Ubuntu 16.04, 15.10, 14.04. I just wanted to summarize all basic steps so that Docker installation on Ubuntu is actually quite simple. My Ubuntu kernel is 3.13. It’s good to get started. This will make sure APT can get latest and related certificates of its repositories. If the file was exist, empty the file content. 1.2.3. Add below entry to the file. sudo bash -c "echo 'deb https://apt.dockerproject.org/repo ubuntu-xenial main' > /etc/apt/sources.list.d/docker.list"
Done. You have finished the preparation. Next step will be the installation. Execute below steps in sequence to install Docker on Ubuntu 16.04, 15.10, 14.04. 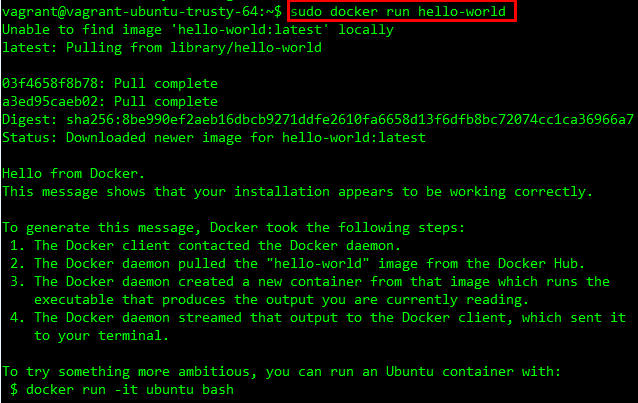 By default, docker deamon run with root user. To avoid using sudo when use docker commands, we will create a group docker and add user to that group. According to the docker document, when the docker daemon starts, it makes the ownership of the Unix socket read/writable by the docker group. Below are steps to uninstall Docker on Ubuntu 16.04, 15.10, 14.04. As for custom configuration files created , you have to delete by yourselves.